The Animas River Whitewater Park in Farmington is a section of the Animas that includes two water features popular with rafters and kayakers. The Animas is a perpetual flow stream that can be paddled in canoes, kayaks and rafts (depending upon water levels). During spring runoff rafters enjoy Class I and II rapids from Animas to Boyd Park. Once flow decreases kayaking and tubing are popular along the Animas River in Farmington. Put in for the Animas River Whitewater Park is at the Animas River Walk Parking lot, near the All Veterans Memorial Park (turn onto South Tucker Ave. from San Juan Blvd., then River Road). Tube the Animas River with Animas Outdoors! This family owned business offers river tube rentals and shuttle service to help you enjoy the beauty of Farmington's Animas and Berg Park. Tube rentals are $15 per person and include life jacket and shuttle service. Their mobile headquarters are located at the Berg Park entrance Friday, Saturday and Sunday. There are eight points of river access in the Farmington for kayaking and rafting. A local effort has been launched to map the paddle trails that locals are familiar with. 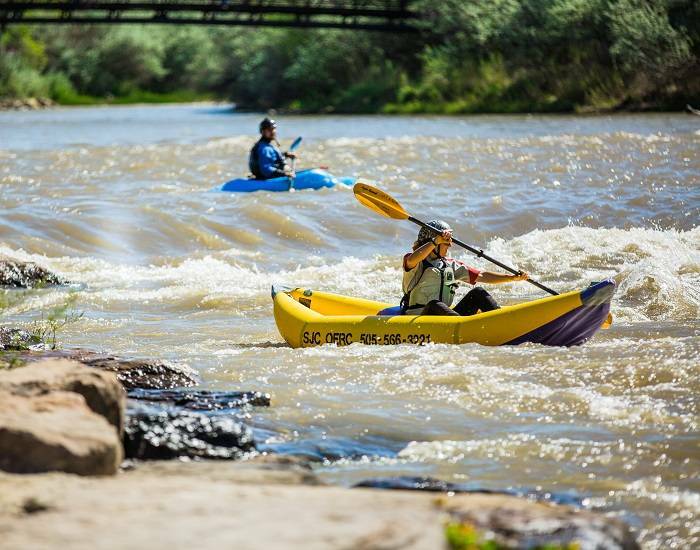 San Juan County hosts the Four Corners Paddle Trails Map, perfect for visitors looking for river access points on The Animas River and San Juan River.